Going to California and frequenting all the farmer’s markets boasting a wide variety of fresh fruits and vegetables always reminds me how wide a variety of fresh fruits and vegetables we don’t have on the East Coast. Don’t get me wrong, we have plenty, but for whatever reason I feel there is a more abundant spread on the West Coast. Or maybe it’s just that they have an abundance of my favorites, like avocados and strawberries. Or the most delicious pluots I’ve ever tasted in my life. Not to mention that my favorite fruits and veggies always seem a lot cheaper in California. Which sounds weird until you remember I live in Northern Virginia where everything costs an arm and a leg more than if I were back at my parents house in rural Pennsylvania. Maybe it’s because the stuff is local to California? Anyway. One thing the East Coast DOES have plenty of is summer squash. Green, yellow, doesn’t matter. We have boatloads. Which is highly fortuitous for me because I love it. And it doesn’t hurt that you can do so much with it! I’ve roasted it, baked it, breaded it, grilled it…ok, now I’m starting to sound like Bubba from Forrest Gump. I’ll shut up now. Really, it was only a matter of time before I figured out you could make boats with it. 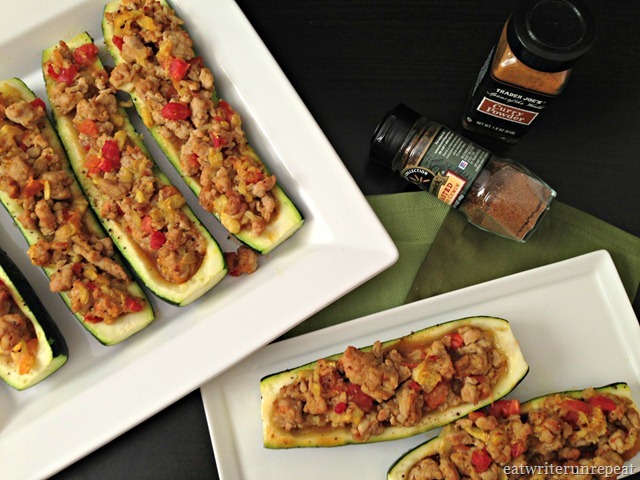 I first saw a recipe for zucchini boats on a Whole30 website – something with dijon mustard and turkey, I remember that much. They were pretty good and it wasn’t long before I started to experiment with flavors. 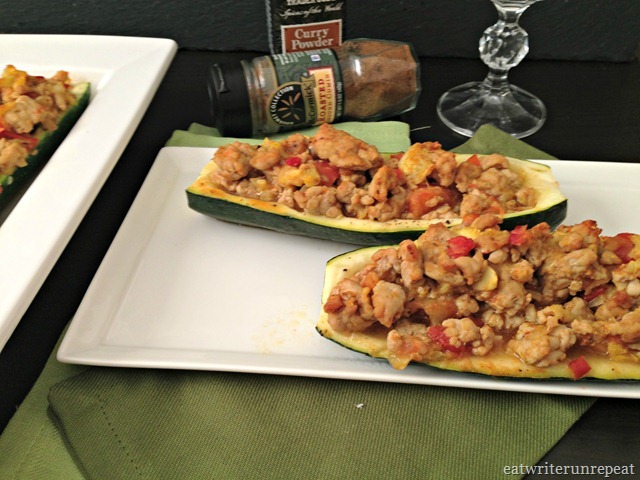 I sort of came up with these curried chicken zucchini boats by accident. Not that curry and chicken is anything out of the ordinary. And really I say accident, but all I did was take cumin and curry powder and throw it in the bowl with the rest of the ingredients. So, maybe it wasn’t so much an accident as me going with tried-and-true. Either way. I actually kept these pretty simple and stuck with just the basics – ground chicken, onion, garlic, curry powder and cumin…I even added some fresh diced tomato to the mix. This is a prime example where simplicity equals delicious…which, let’s be honest, happens a lot in my kitchen. Have I mentioned I can be kind of lazy? I had originally intended to share some other zucchini boat ideas with you all, but as I wrote this post my brain was frying on the flight to San Francisco. Seriously. Why is it that airplanes are always either sweltering hot or ice cold? Why can’t it just be pleasant? …and more importantly, why do I always get stuck sitting next to a passenger with horrible gas? Slice zucchini in half longways. Using a spoon, hollow out the zucchini, reserving inside for later. In a skillet over medium heat, saute garlic and onions until translucent. Add the ground chicken and brown. Once chicken is cooked, add tomatoes and zucchini, stir to combine and heat through. Add spices and combine well. Cook for approximately 10 minutes. Meanwhile, coat your zucchini boats and the bottom of a glass baking dish with olive oil. 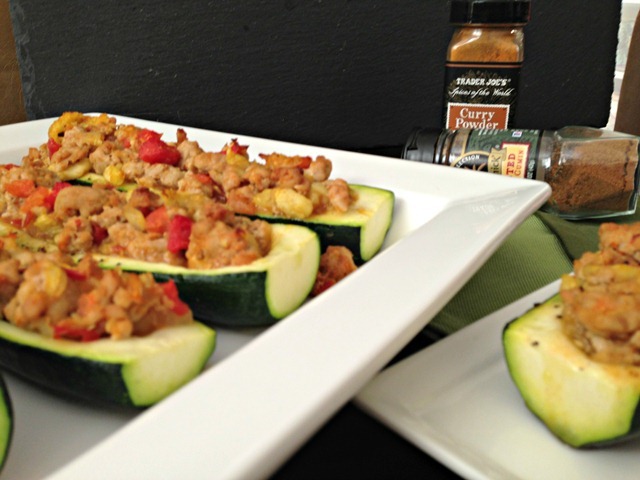 Once mixture is cooked, fill zucchini boats with equal portions of the mixture and bake at 350 for approximately 40 minutes, until zucchini boats are soft and easily pierce with fork. If desired, top boats with mozzarella cheese and cook for the last ten minutes until cheese is brown and bubbly. I’m sharing this recipe over on vegetarianmamma.com as part of Gluten Free Friday! Hop on over to find more gluten free recipes and share the love! 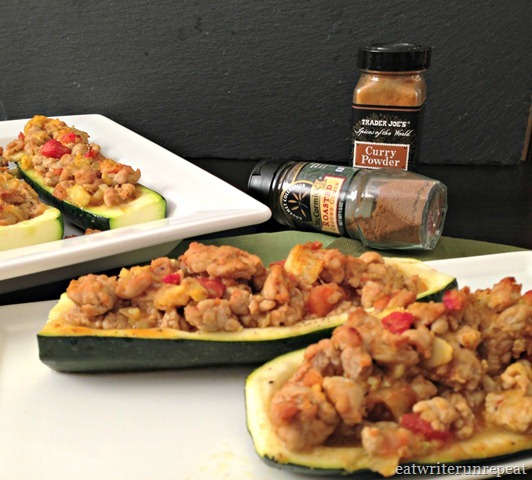 Posted on 2 August 2013 2 August 2013 by BeePosted in Chicken, Dinner, Whole 30Tagged Chicken, cumin, curry, dinner, gluten free friday, Whole 30, zucchini, zucchini boats. Mmmm.They look and sound good. These look delicious and anything that references Forrest Gump is instantly better.